Product prices and availability are accurate as of 2019-04-17 15:44:32 EDT and are subject to change. Any price and availability information displayed on http://www.amazon.com/ at the time of purchase will apply to the purchase of this product. 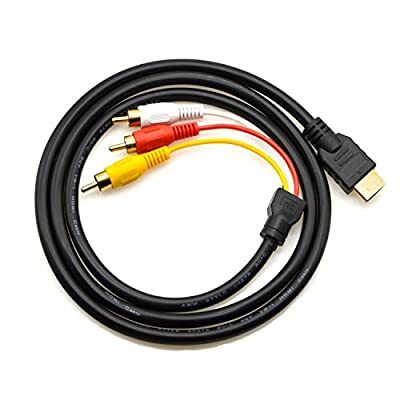 1:HDMI to RCA cable is designed to connect and transfer(NOT CONVERT) signals from HDMI port to RCA port. 2:This cable functions as a signal transmitter, but NOT a signal converter. 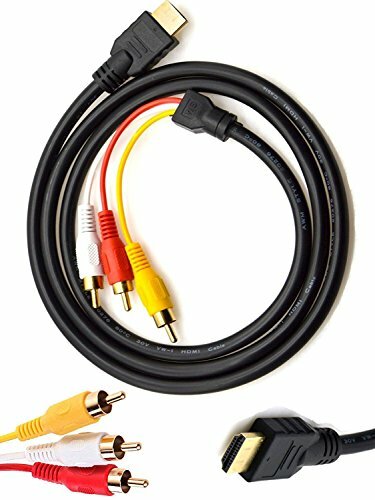 3:As HDMI carries digital signals while RCA carries analog signals. 4:If both input / output device do not support signal conversion, a signal conversion box is required. 5:Even though HDMI cables support Hot Plug Detection, improper usage might result in resetting / restarting both devices, or even may cause damage to the devices. Therefore, we do not suggest Hot Plug action for any HDMI cables. Please make sure both input and output devices are off when plugging or unplugging HDMI cables. 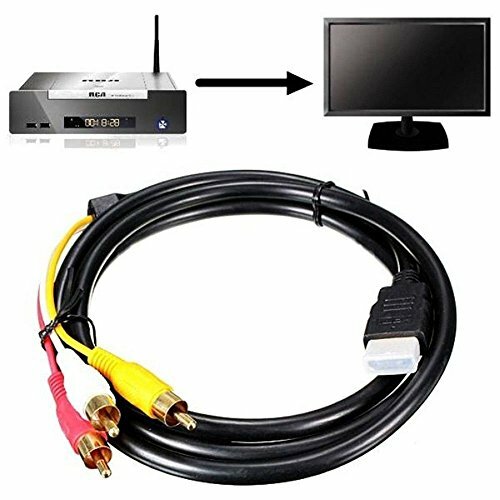 Note: this cable is not compatible with PC / laptop / Xbox/ DVD to HDTV directly; before purchasing, please make sure both devices have signal coding and decoding function; If the devices do not support coding and decoding,please buy a conversion device separately. 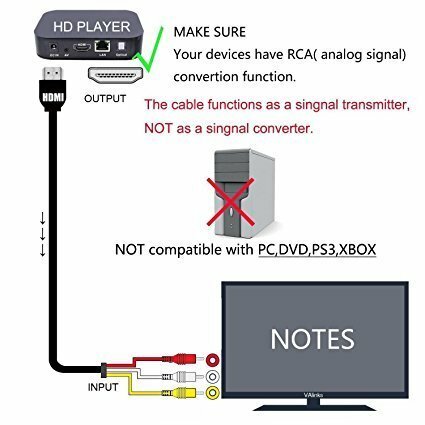 HDMI is digital signal and RCA is analog signal, and the cable does not convert digital signals to analog signals.This cable functions as a signal transmitter, but NOT a signal converter. 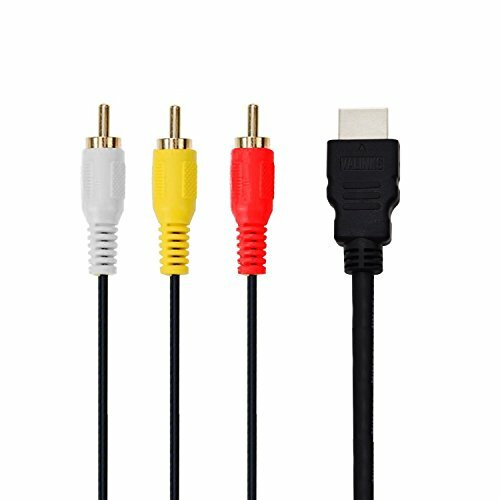 This is a HDMI to RCA one-way transmission cable, RCA to HDMI cannot be used, which means the display device (TV or monitor) is the RCA end. 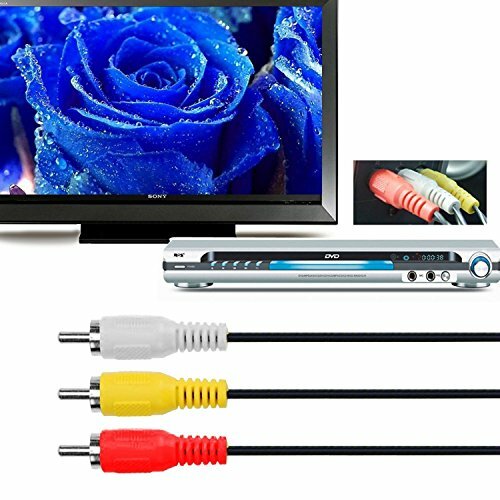 Ideal for HDTV receivers, high-definition DVD players,TV sets, projectors, A/V receivers, and other HDMI-equipped devices.Support all HDMI 1.0 - 1.3 all Version. Please make sure both input and output devices are off when plug and unplug this cable.Please check whether this product is compatible to your equipment before making the purchase.